In this Facebook design, Kay Int Veen seems to be peeking out from behind the page. This illusion was created by integrating a white bar that seems to be part of the Facebook page design with an image, cleverly posed to fit the space. He then added a collage of images on the left-hand side. In this case, there is no interaction between the Profile photo and the other photos; but the generous amount of white space between the two elements helps them work well in the shared space. In this Facebook design, Sven De Bruyne took a photo of himself looking off to the side, flipped it upside down, and repeated it in the Profile and cover photos. Because he appears to be looking from one image to the other, the combination creates a dramatic effect. It’s a challenge not to let your own eyes dart between the images in this design. In her Facebook design, Rachel Brenke showcases her specialized talent for helping creative professionals with everything from basic legal permission forms to more serious matters. Rachel is a photographer and an attorney, and her inviting pose in her photos gives her Facebook profile a warm and friendly feeling. Using both color and black and-white images gives the design a creative touch. 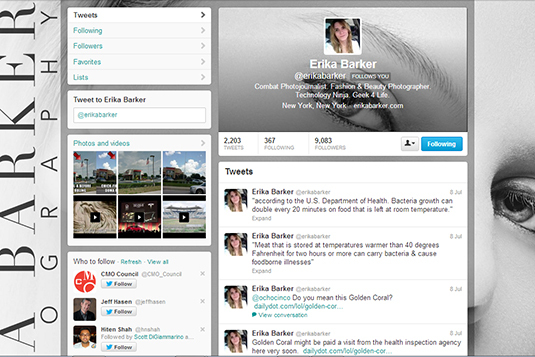 Photographer Erika Barker creates a clever illusion on Twitter by using a section of the background image in the header area. The effect appears that the header and background are all one image, even though they were cropped and uploaded separately. 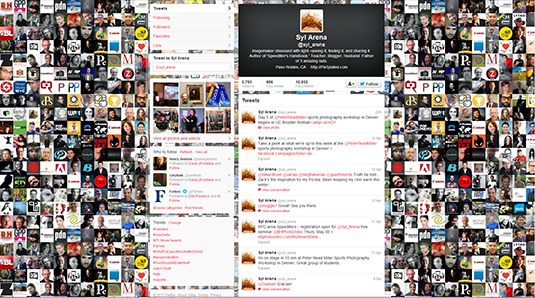 Author and photographer Syl Arena created a grid of tiny images for his Twitter background. By using a combination of portraits, company logos, and goofy cartoon images, he constructed a background with a range of colors and styles. 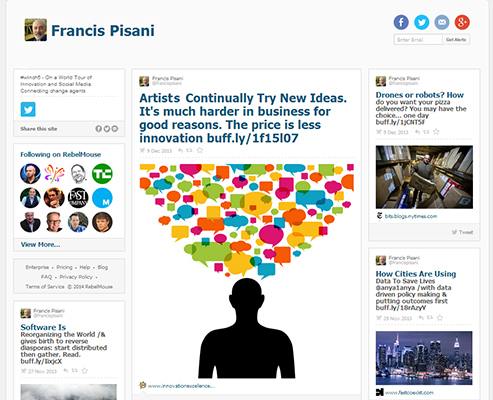 Although the design is a little busy, it works well on any screen size and provides followers with a quick insight into his many interests. 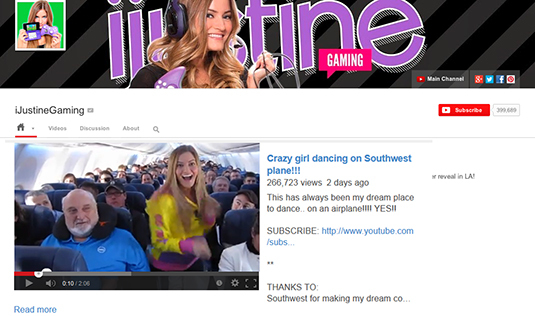 On YouTube, Justine Ezarik makes good use of props (such as a video-game controller) to give her viewers visual cues as to which of her many channels they have tuned into. 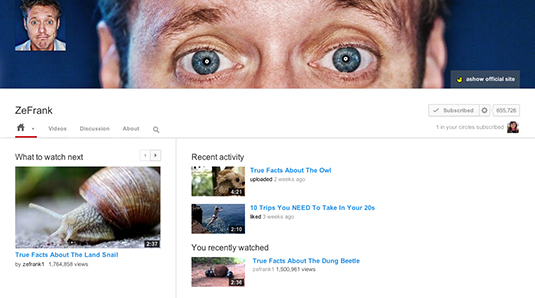 She also includes buttons on her YouTube header that take users not only to her other social media profiles, but also to the main channel or to a webstore. 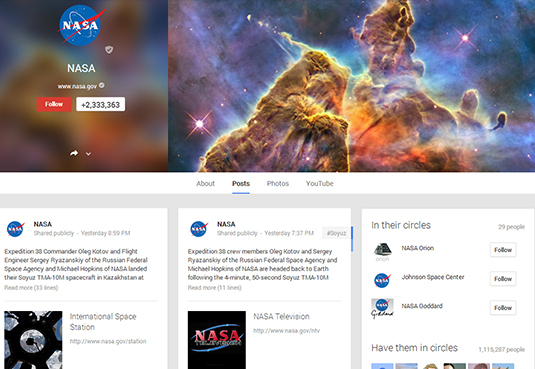 You’d expect NASA to be particularly well suited for such a nerdy social media platform as Google+ — and you’d be right! The space agency regularly updates its profile with stunning panoramic photos that take advantage of the extra display space that Google+ gives its viewers. A rocket launch -6 is just one of the images that NASA regularly updates; the images of Earth from space, astronauts out on spacewalks, or intergalactic quasars are changed regularly to reflect the latest achievements. Photographer, author, writer, and editor-in-chief at Best magazine, Olga Egoraeva shares her fashion photography on Flickr. Olga uses a relatively simple background for her banner but opted for the doubled profile photo. Lesa Snider is a photographer and creativeLIVE instructor. Lesa (often called “Photo Lesa”) showcases her travel photos and takes advantage of the large amount of storage space available on Flickr.